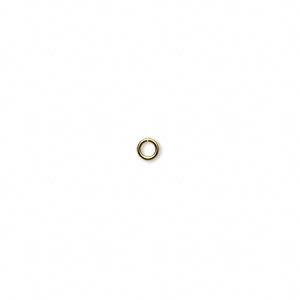 Jump ring, 14Kt gold, 3.5mm round, 2.2mm inside diameter, 22 gauge. Sold per pkg of 4. Precious metal jump rings are measured in millimeters on the outside diameter. Jump ring size, gauge and inside diameter are approximate. Jump ring, 14Kt gold, 3.3mm round, 2mm inside diameter, 22 gauge. Sold per pkg of 4. Jump ring, 14Kt gold, 3.5mm round, 2.5mm inside diameter, 24 gauge. Sold per pkg of 4. Jump ring, 14Kt gold, 5mm round, 3.6mm inside diameter, 22 gauge. Sold per pkg of 4. Jump ring, 14Kt gold, 5mm soldered round, 3.6mm inside diameter, 22 gauge. Sold per pkg of 2. Jump ring, 14Kt gold, 3mm round, 2mm inside diameter, 24 gauge. Sold per pkg of 4.